I've tried the "running thing" three times now. My first attempt, while we still lived in Ohio, fizzled out early due to a hip injury. We were concerned that I'd broken some bone in my pelvis, but X-rays showed nothing. Unfortunately, that didn't help me feel any better. I limped around for several weeks and decided that running just wasn't for me. Too bad it was helping me lose that college weight... I'd have to find something else. Then, when I moved to Texas, and was living sans hubby for the first six weeks, I tried it again. I was bound and determined to look as hot as possible when he arrived in Texas after finishing up his work obligations. Running in Texas was horrible in the 90 degree heat, but then became wonderful as the fall/winter months arrived. I loved it even more, as I watched the pounds fall off of me. Sadly, my hip started screaming at me again, so I found myself on the bike and in the yoga studio more often instead. 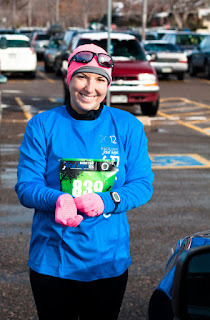 I ran in my very first 5K race this past Sunday. Ran for a very good cause and organization: The Fetal Hope Foundation. 3,000 Coloradans showed up for the race in Washington Park, Denver! It was 20 degrees outside, and I had three layers of clothes on. My goal was just to finish. If I could run negative splits (each mile faster than the last), then that would be bonus. And if I could finish in under 30 minutes, then even better! I ran harder than I have in a long time, and I crossed the finish line at 31:27. I had run a 10:14; 9:58; 9:38. I couldn't believe I'd run negative splits after all!! After we crossed the finish line, we had vendors, a food truck, and a live band to help us celebrate. I got a high-five from my coach, and an excited motivation speech on where we go from here: farther and faster!! And what better song to greet me personally at the finish line than Journey's "Don't Stop Believing." Perfect.